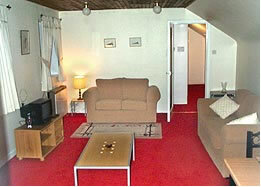 Kitchen - fully fitted with microwave, cooker and fridge and there is access to a washing machine. Two bedrooms - one double bedroom and a single room with bunk beds. The property comfortably sleeps six people. All electric and bedding are included at local cost, but please bring your own towels. There is a small patio area, ideal for barbecues on hot summer evenings. Two acres of land to explore and watch for the wildlife, including Buzzards, badgers, otters and Owls.